Which Is the Best Travel Rewards Credit Card? A large number of financial institutions and credit card companies offer travel rewards credit cards. The perks available to cardholders vary amongst the products, so it's important to shop around to find the travel rewards card that is best for you. There are plenty of travel rewards cards available, but there are a few great credit cards that offer particularly impressive reward incentives to consumers. The Bank AmeriCard Travel Rewards Visa offers new customers 10,000 bonus points, which is equivalent to $100 that can be used toward travel purchases. In addition, cardholders are not assessed an annual fee, and can earn 1.5 point per dollar spent on qualifying purchases. Customer bonus points equivalent to 10% of all purchases are distributed annually to those with eligible Bank of America accounts. The introductory offer and absence of an annual fee definitely makes this card worth considering, as noted by a review from Ivan Daniel of Daily Markets. Capital One's Venture Rewards Visa Credit Card allows new cardholders to earn 10,000 miles if they spend at least $1,000 within three months of initially opening the account. All other purchases earn two miles per dollar with simple and flexible travel redemption options. In addition, the card does not have an annual fee in the first year. A recent review from Daily Markets also noted that the card offers unlimited earning potential while allowing cardholders to access Visa Signature benefits. Chase's Sapphire Preferred Credit Card enables cardholders to earn $500 in travel rewards -which is equivalent to 40,000 bonus points- if they expend at least $3,000 in the first quarter. All travel purchases qualify for double points and receive a 20% discount if points are redeemed for travel via the Ultimate Rewards Program. For the first twelve months, cardholders can also enjoy the benefits without paying an annual fee. According to a review from Nerd Wallet, the impressive introductory offer and earning potential make the card worth looking into, although it comes with an annual fee after the initial year. Blue Sky Preferred Card from American Express enables you to earn 15,000 points as an introductory offer if you reach $1,000 in expenditures within the first three months. Select lodging and rental car purchases qualify for double points. Each point earned for travel purchases is equivalent to $1.33 if redeemed in the form of a statement credit, as noted by a review from Jason Steele of Money Crashers. Cardholders also receive a $100 airline allowance annually. Escape by Discover grants all new cardholders access to 25,000 bonus points if they make at least one purchase each month in the first 25 months. Redemption options are also very flexible as points can be redeemed through any travel agency, travel website or airline. Cardholders from Credit Karma mentioned that the card is good if used responsibly because of the generous point system. Gold Delta Sky Miles Credit Card from American Express offers new cardholders 30,000 miles as an introductory bonus if they spend $500 or more within the first three months of opening a new account. Cardholders have an unlimited earning potential and miles never expire, as noted by a recent review from Daily Markets. Delta purchases qualify for double miles, making this the perfect card for those who frequently travel via Delta airlines. JetBlue Card from American Express enables you to earn 20,000 bonus points as an introductory offer if you spend at least $1,000 in the first three months. Expenditures made toward qualifying JetBlue purchases can also earn up to eight miles, which is a major perk for those who prefer to travel via this airline. A review from Credit Card Forum also noted the low annual fee of $40, which is rare for cards of this sort. The Starwood Preferred Guest Card from American Express offers 25,000 bonus points if you spend $5,000 or more within the first six months. Each dollar spent at qualifying hotels and resorts receive five points redeemable for free stays at locations worldwide. Reviews from Credit Karma indicated customer satisfaction because of the ability to accumulate a large number of points in a brief period of time. Some individuals noted that they saved a large amount of money on lodging during family vacations as a result of the points generated from using the card. The Hilton HHonors Visa Signature Card grants cardholders the opportunity to earn one free night -which is worth 40,000 points- by expending at least $1,000 within the first four months. Overnight stays at Hilton properties receive six points per dollar, making it easier to quickly accumulate free nights. Considering the lack of an annual fee, this is a tremendous value for Hilton customers, as noted by Cliff Brody of Reviews.com. Determine the features you want the most in a travel rewards credit card to simplify the selection process. The APR usually varies depending on your credit rating. In some instances, your credit history may disqualify you from inclusion into a program. Ultimately, you must figure out the maximum amount before fees that you are willing to pay to enjoy the benefits that the credit card offers. Most travel rewards credit cards come with an annual fee. If you plan to transfer balances or exercise the cash advance option, consider those fees as well. 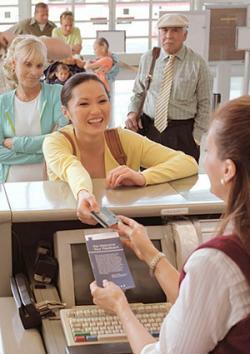 Some travel rewards programs enable cardholders to accrue an unlimited amount of rewards without any restrictions. However, keep in mind that certain systems have limits, reward expiration dates and blackout dates. Also, redemption options may be limited to the card issuer's products and services. Which Travel Rewards Credit Card is Right for You? An abundance of travel rewards credit cards are available, so it is important to take your time and research the terms and conditions of each card before deciding on one over the others.